Spiders living together in colonies of tens of thousands can go extinct from sharing food equitably, finds new UBC research. "It's an unfortunate byproduct of what they have to do survive," said lead author Ruth Sharpe, a PhD student in UBC's department of zoology. "It's a puzzle because in this case, evenly splitting resources may not be beneficial to the colony." This spider species, which goes by the Latin name Anelosimus eximius, lives in South America in colonies of anywhere from one to tens of thousands. Social spiders are found in tropical areas of the world but no other species forms nests as big as Anelosimus eximius. The colonies grow so large because offspring typically remain in the nest they were born in from one generation to the next. They nest together, forming one very large web, and work together when they capture prey like bees, wasps, butterflies, and other insects. 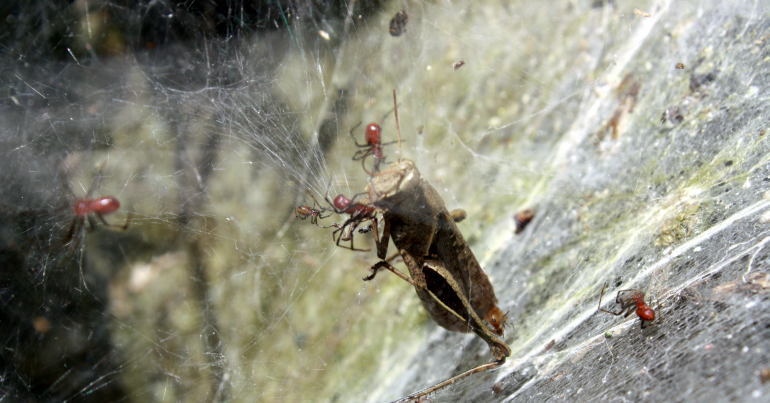 Social behaviour works well for the spiders until food becomes limited, likely because the colony grows too large. Sharpe and UBC zoology professor Leticia Avilés believe the problem occurs because large colonies tend to capture prey that are too large for any one spider to monopolize. Instead, many spiders will take a share and if they cannot capture enough prey, none will get enough food, potentially leading to massive die-offs. In earlier research, Avilés found that about 21 per cent of established Anelosimus eximius colonies go extinct every generation and that the size of the prey captured increases with colony size. "We did this research to figure out why large, well-established colonies were going extinct so swiftly," said Sharpe. "Once I saw a massive nest on the side of the road in Ecuador, about five metres tall and four metres across. I went back a few weeks later and it was completely gone." The study was published this month in the Journal of Animal Ecology.